London Heathrow Airport (IATA: LHR, ICAO: EGLL) is the largest airport in the Greater London area, and many international flights will arrive at Heathrow. One of the world's busiest airports, Heathrow is crowded and known for outrageous line-ups and lost luggage. No any other airport handles as many international travellers as Heathrow. There are numerous options to get to and from Heathrow Airport. Heathrow Express is a non-stop train service that offers the fastest travel option to Paddington station in central London. Services run every 15 minutes and the journey time is just 15 minutes; a few minutes more for Terminals 4 or 5. A standard single ticket (2010) purchased online is £16.50 (£18.00 from ticket machine/office; £23.00 purchased onboard) and a standard return is £32.00 (£32.00 from ticket machine/office; £37.00 purchased onboard). Heathrow Connect is a stopping train service between London Paddington and Heathrow Airport, and calls at Ealing Broadway, West Ealing, Hanwell, Southall and Hayes & Harlington. Running every 30 minutes, a journey takes up to 25 minutes. Single tickets are from £4.90 to £7.90, depending on the destination. 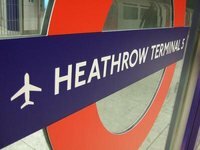 Heathrow is on the Piccadilly line of the London Underground network, with three stops at the airport – Terminals 1 and 3; Terminal 4 and Terminal 5. There are two different train services; one stopping at Terminals 1 and 3 and Terminal 4, while the other at Terminals 1 and 3 and Terminal 5. Journey time to central London is under an hour and you shouldn't have to wait longer than 10 minutes for a train – even off-peak. A single ticket into central London (Zone 1) costs £4. Heathrow Airport is served by an extensive network of local buses which operate from the central bus station. Some services also stop at Terminal 4. Services into west London are part of the Transport for London network. A single adult fare for anywhere in London is £2. The bus station is well signposted from Terminals 1 and 3 and is located above the London Underground station. Access from Terminals 1 and 3 is via underground walkways. The approximate walking distance from Terminal 1 is four minutes, and from Terminal 3 is seven minutes. The routes from the airport can be found on this map. Information on services can be found at the TfL website or by calling +44 (0)20 7222 1234. You can also connect National Express directly. Their buses numbers 032, 035, 403, 412 and 501 (one way/return from £10/15, tickets valid three months; 45 minutes to 70 minutes, every 30 minutes to one hour) link Heathrow with Victoria coach station (7730 3466; 164 Buckingham Palace Rd SW1) over 50 times per day. 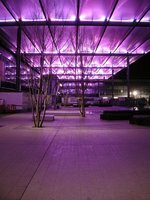 The first bus leaves the Heathrow Central Bus station (at Terminals 1, 2 and 3) at 5:35am while the last departure leaves at 9:35pm. In the other direction, the first bus leaves Victoria at 7:15am, the last at 11:30pm. Taxis are available at Heathrow Airport 24 hours a day. There are taxi ranks at all terminals, as well as taxi information desks inside. It costs about £45 to £70 to central London and the average journey time is approximately an hour. Terminals 1 and 3 are within walking distance of each other. Transport to Terminal 4 is by Heathrow Connect trains or bus and to Terminal 5 is by Heathrow Express trains or bus. On Heathrow Express, Heathrow Connect and local buses the sections between Heathrow Central, Terminal 4 and Terminal 5 are free of charge. ULTra Personal Rapid Transport is currently being constructed as a trial shuttling passengers to and from Terminal 5. The initial trial will have 18 pods running. ULTra are small transportation pods that can fit four adults, two children, and their luggage and will be able to carry passengers directly to the terminal. The pods are battery powered and will be initially used on a four-kilometre track. If the trial is successful there are plans for a roll out airport wide. There are currently four terminals in operation: Terminals 1 and 3; Terminal 4; Terminal 5. Also check the List of Airlines for the websites of these airlines. Or check the information about budget airlines. We have a comprehensive list of accommodation in London Heathrow Airport searchable right here on Travellerspoint. You can use our map to quickly compare budget, mid-range or top of the range accommodation in London Heathrow Airport and areas nearby. This is version 19. Last edited at 3:41 on Aug 2, 17 by sleepBot. 8 articles link to this page.